Rabbi Yamin Levy is senior Rabbi at Congregation Beth Hadassah, Iranian Jewish Center in Great Neck / Kings Point in New York. He teaches at Shalhevet High School for Girls in Five Towns and works closely with the administration of Mesivta Rambam Yeshiva High School for Boys. He is also the Rabbi of the Long Island Hebrew Academy in Great Neck. Formerly Rabbi Yamin Levy held the position of Vice President at Yeshivat Chovevei Torah and Academic Director of Sephardic Studies at Yeshiva University where he taught Bible, Jewish Law and Maimonidean Studies in the Isaac Breuer College and at Stern College for Women. 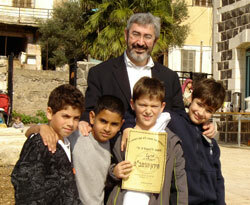 Rabbi Levy spent 22 years in the rabbinate in three communities: Highland Park NJ, Seattle WA and Great Neck, NY. He is the author of the nationally acclaimed Confronting the Loss of a Baby: A Personal and Halakhic Perspective which was translated into Hebrew by Ruben Mass Publishers. He is also author of Journey Through Grief: A Sephardic Manual for the Bereaved and Their Community. Rabbi Levy is co-editor of Religion Reason and Community: The Life and Legacy of Maimonides and the editor of Mishpetei Shalom: A Jubilee Volume in Honor of Rabbi Saul (Shalom) Berman. Rabbi Levy has published numerous articles on Jewish thought, Maimonides, and Bible in English, Hebrew, French and Catalan.